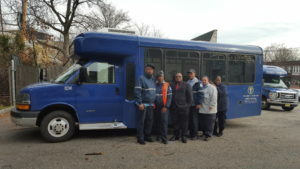 RWDSU/UFCW Local 108 members who work as drivers for the Gateway shuttle bus in Newark, N.J., ratified their first union contract earlier this month. The shuttle bus drivers joined RWDSU/UFCW Local 108 last year to improve their pay and treatment, and the new contract provides raises, added vacation time, and more overtime opportunities. “The Gateway Company has grown and become very profitable over the years, and workers deserved the improvements they are getting with their first contract,” said RWDSU/UFCW Local 108 President Charles N. Hall, Jr.